Bollards? Get rid of them! Dear Reader. You may have thought that I have disappeared off the edge of the world since my blog is a little late this month. I have just returned from a splendid holiday sailing the Med. 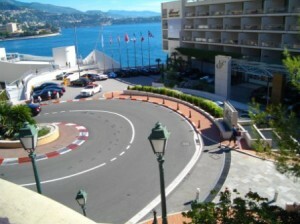 Monaco was one point of call and here is a photo of a hairpin bend on the Grand Prix race track. This road is normally open to the public but closed during race days. The view down there is splendid so bollards are set in the pavement to stop drivers parking to admire the view. Naturally they are unscrewed during the Grand Prix since they would be a danger to the drivers. It seems that Formula 1 drivers are too busy to stop to admire the view. I was wondering why so many lumps are set into our roadside here in Blighty. They are clearly a danger to road users. Yet I can hardly believe that drivers would want to stop to admire the views around, for example, The Western Industrial Area here in Bracknell.